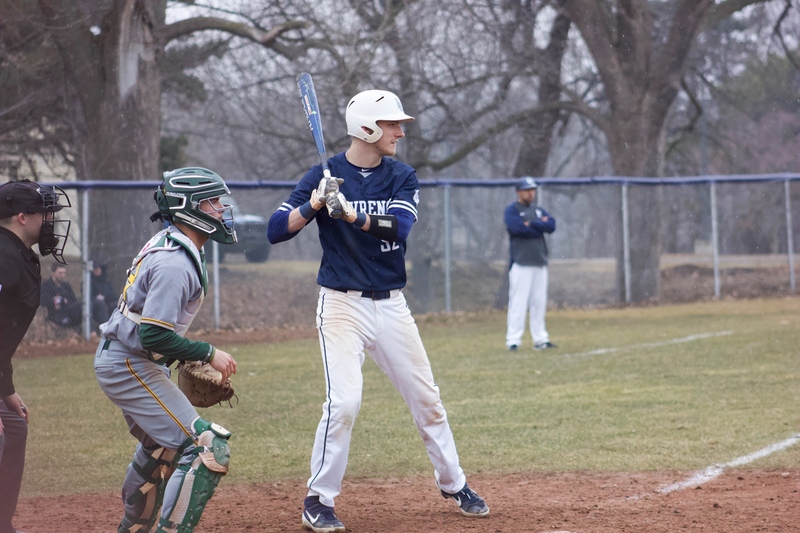 Senior Andrew Lauber hit a grand slam in the third inning of their opening game against St. Norbert. Sophomore Nick Guzzo battled against the rain and the batter. The team comes together to play this game because they have a passion for it, the dirt, the sound of a ball coming off of a bat, and this comradery leads to successful teams. Pastrone commented, “I love the team aspect of baseball, and it’s helped me make many new friends coming into school here at Lawrence. I play because of how fun the game is and how fun it is to play with my teammates and the great coaches we have”. Pastrone has only just started playing first base. He said, “This is actually my first season playing first base. I tore my labrum in my shoulder freshman year in the fall playing football and got surgery in the spring to recover for football season. Due to the surgery, I haven’t been able to fully recover in the throwing process yet, so I had to make a transition from second base to first base because first base has to make less throws. The biggest challenge has just been learning the new position and getting used playing in games at first”.